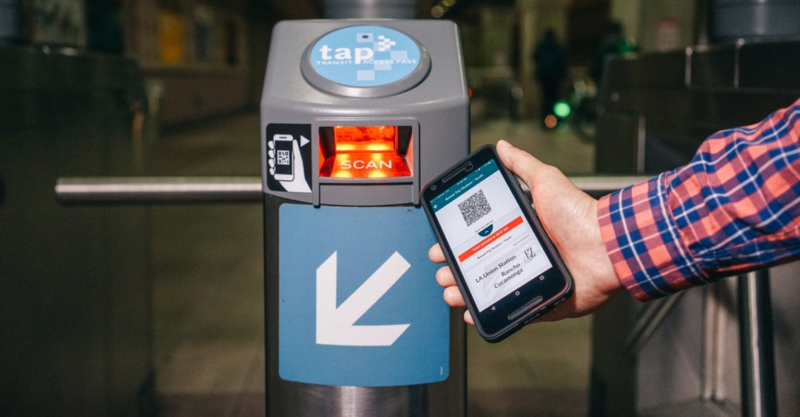 Los Angeles - January 8th, 2018 - Masabi, the global leader in mobile ticketing for public transport and innovative fare collection, today announced the successful launch of an integrated mobile ticketing solution for the Los Angeles County Metropolitan Authority’s (Metro) system, allowing seamless transfer between Metrolink commuter rail services and the gated Metro Rail network. The system combines a mobile app with optical readers mounted at Metro station gates linked to Masabi’s Justride Inspect Software, enabling validation of tickets and gate activation. This eliminates the need for Metrolink passengers to wait in line to purchase paper tickets for onward journeys. Around 185 gates - more than half - are now mobile-enabled with more stations coming online in the future. Masabi launched the Metrolink app in early 2016, and already processes 26% of all fare revenue, while enabling riders to continue their journeys using the app on local bus services as part of the EZ Transit Pass program. Until now however, the 30% of Metrolink riders who transfer to Metro Rail services on a daily basis had to purchase separate paper tickets before boarding, leading to lines at ticket machines and increased congestion at stations. A new version of the Metrolink app accommodates the purchase and display of tickets that enable travel on Metro Rail services as part of the EZ Pass program.